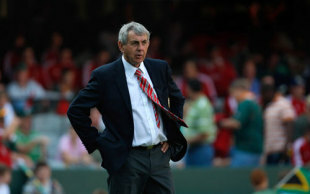 British & Irish Lions boss Ian McGeechan has admitted that his side's last-gasp defeat to South Africa in the second Test at Loftus Versfeld was one of the most difficult to take in his long and storied career. McGeechan's Lions fell to a series defeat after Morne Steyn's penalty secured a 28-25 win for the Springboks, and the Scot was downcast after his side's efforts counted for naught. "It's certainly one of the biggest (disappointments), because I think the players deserved more. Just to see their faces afterwards was very sad," McGeechan told Radio Five Live's Sportsweek. "We could be sat here with two Test victories. We haven't had the rub of the green on the field. The effort that has been put in by the players has been phenomenal." McGeechan has lost props Adam Jones and Gethin Jenkins for the third Test due to injury, and faces a wait on the fitness of Brian O'Driscoll, Jamie Roberts and Tommy Bowe, but is confident that whoever takes to the field the Lions have what it takes to end a barren run in Test matches stretching back to 2001. "There's a lot of character in this group," he said. "People asked me the same question last week and I think they got their answer. It will be the same again. They're an incredible group of young men. Whatever happens with injuries, we'll be ready to win the third Test." South Africa flanker Schalk Burger was sin-binned for an alleged eye gouge in the opening minute, and will now face the citing panel. McGeechan was clear on the issue, saying that he believes the offence warranted a red card. "I could never condone actions like that," said McGeechan. "I would hate to see those again. It should automatically be a red card, as I understand it. "I heard a quote (from South Africa coach Peter de Villiers) that it might be part of the game. To me, that is never part of the game. I am very disappointed he (de Villiers) said that. I can't see that ever being part of the game. It certainly wouldn't be part of a game I want to be associated with."